Economy: World Needs an Upbeat Message; Where Are The “Leaders”? People worldwide are “depressed and traumatized” to see their life savings, including homes and pension funds, disappearing, Rupert Murdoch said at a press briefing in Davos, Switzerland, last week. And President Obama’s Inauguration speech on January 20 (that seems like a lomg time ago already) didn’t exactly hit a chord of uplifting delight. And there have been several suicides of financial “experts” or people who lost a lot of money recently. The war on terror and good times seems to have put us all to sleep. The shopping malls were full and most of us had jobs. Now the shopping malls are not full and the credit card needs to be paid off. Maybe the American people need to make some sacrifices. But let’s not forget, mankind has survived more than this. 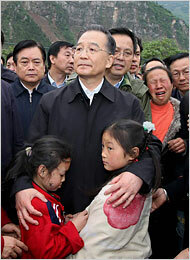 China’s Prime Minister Wen Jiabao passed our compensation money to earthquake survivors last week to start the Lunar New Year. Remember the line, “We have nothing to fear except fear itself”? We might also consider some old passe tools like prayer and hope and faith and service to others. Because there are now four Americans trying to get every available job and unemployment won’t last forever. Enter Gordon Brown who says in the UK at least the public can harness the “British spirit” and remain resolute and upbeat. Note to our leaders: Leadership needs to remember that the public needs a morale boost now and again. Gordon Brown has issued a passionate appeal to the British people for optimism in the face of the economic downturn, insisting that confidence will see the country through the deepening recession. While admitting that Britain is “in the eye of the storm”, the Prime Minister said in an interview with The Daily Telegraph that the country will see off the worst of the slowdown if the public can harness the “British spirit” and remain resolute and upbeat. International forecasters say that Britain is heading for the deepest recession of any advanced economy, with unemployment predicted to pass 3 million, but Mr Brown appeals against “talking the country down”. In a striking show of optimism, he declares: “I am absolutely confident about Britain’s future. I have utter confidence in our ability to come through this. I have utter confidence not only in the British people’s determination to come through this, but that people will work together to make sure Britain emerges from this. “The British spirit is to see a problem, identify it, and get on with solving it. Once a problem hits us we are determined and resolute and we are adamant that we are going to deal with that problem. sliding into protectionism and an economic slump similar to the Great Depression of the 1930s. The April summit, hosted by Mr Brown, will bring together leaders of the G20 economies, including Barack Obama, the US president. You are currently browsing the archives for the public category.